Black and gray tattoo art has had a major resurgence among collectors and artists. 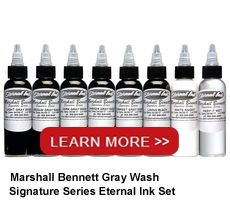 Marshall Bennett has played an important role in its popularity. With a remarkable talent for photorealism in portraiture, pinups and wildlife, Bennett’s tattoo portfolio has influenced a generation of future tattoo artists. Bennett's subtle blending with layers of black and gray builds an impression of reality. The final image emerges as a monochromatic photographic illusion.